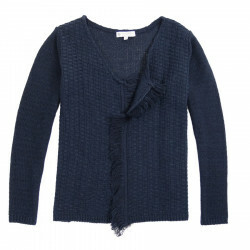 This marine cardigan with a crew collar has fringes facets and a fancy mesh. In front, the intersected mesh offers a lovely work, very trendy. This open cardigan v collar has fringes facets and fancy mesh. In front the intersected mesh offers a lovely work, very trendy. This cardigan will match perfectly a light summery t-shirt. 75% acrylique and 25% cotton.